Figure 32. 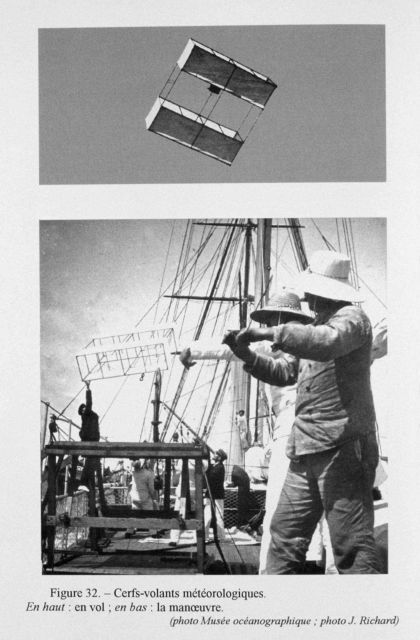 Meteorological kite flown from the PRINCESS ALICE II. Professor Hugo Hergesell of Strasbourg interested Prince Albert in exploring the high atmosphere. As such, the first studies of the upper atmosphere while at sea were conducted off the PRINCESS ALICE II on April 12, 1904, to an altitude of 4500 meters. Photo Location: Atlantic Ocean 43 35.8 N Lat., 7.75 W Long.